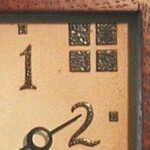 The designs for the clock faces are taken from original fonts from the early 1900’s. They are silkscreened onto gessoed MDF panels and treated with an embossing process to give a textured “hammered metal” look. The faces are then tinted with glazes to give an an antiqued look and to complement the finish of the wood. Most of the designs are available in all of the clock styles and sizes. Check with me for availability.